Surcoat (2016)is a set of Medieval Fantasy Miniatures Wargaming rules written by me and that I have been playtesting for close to a decade and a half. 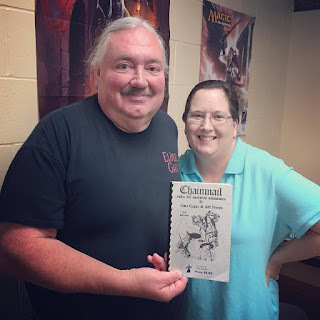 They incorporate influences as far flung as Chainmail (1971) which I played in the early 1970s to Warhammer (1983) to Hordes of the Things (1991) (based on De Bellis Antiquitatis (1990) which I should include here as an influence in its own right as well as De Bellis Multitudinis (1993)) to Field of Glory (2008) as well as many more minis wargames old and new that shaped my thinking on such systems up to today. The name, of course, is a homage to the first Medieval Fantasy minis wargaming rules I played, the aforementioned Chainmail. I recently ran a slot of Surcoat at Gary Con VIII, pictured below, which was well received and I have a couple more games planned at upcoming events in the area. When I am asked why after four and a half decades of playing minis wargames I am writing one of my own, why I haven't before, and why after starting playtesting so long ago I haven't released it yet, it gives me pause for thought. Truth is, I love the games I have played and am not looking to publish to replace any of them. I don't feel there is necessarily any deficiency in the market, as such. I also don't think that what I will eventually publish is going to feel particularly groundbreaking though they might seem somewhat innovative. Others will be the judge of that. This just feels like something I want to do though I haven't felt rushed to meet any sort of outside or financial deadline. I've been lucky in that regard and I do think the rules are about ready for widespread release. My goal is to produce a rather simple, straightforward set of unit-to-unit Medieval Fantasy wargaming rules that can scale nicely to handle combat for very large armies utilizing a d20 as the primary resolution method and which players can buy in for almost nothing more than their time and imagination. I'm not looking to sell a minis line along side these rules nor to pile up quarterly supplements that must be purchased to keep up with a manufactured arms race though I would like to put out a few army list books tied to my Grymwald setting at some point (but they won't be required reading to use the rules). So, Keep Rolling and Game On and watch for near-future developments on Surcoat!